Funeral services for Alvin H. Thompson, age 83, of Albert Lea, formerly Emmons, Minnesota, will be held at 2:00 p.m. on Saturday, December 8, 2018 at Emmons Lutheran Church. Pastor David Schafer will officiate. Military honors will be accorded by local veteran's organizations. A private family interment will take place at a later date. Visitation will be from 5:00-7:00 p.m. on Friday, December 7 at Bayview/Freeborn Funeral Home and one hour prior to the service at the church on Saturday. Online condolences are welcome at www.bayviewfuneral.com. 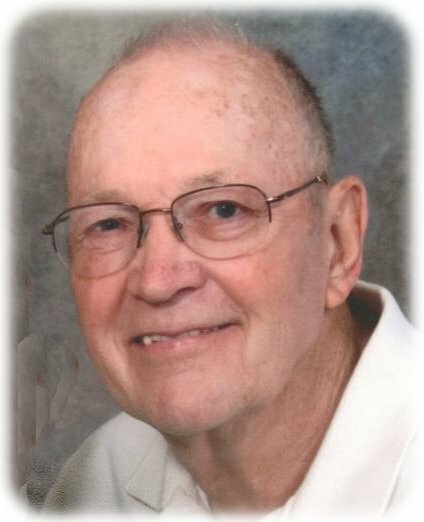 Alvin Harold Thompson, Albert Lea, Minnesota passed away on Monday, December 3, 2018 at 83 years of age. After a year of failing health, he died peacefully at his home in Albert Lea. Alvin was born on April 5, 1935 in Forest City, Iowa, to Anna Hanna and Harold Thompson. As a young boy, Alvin went to country schools in Winnebago and Hancock county in Iowa before graduating from Emmons High School in 1953. After graduation, Alvin started work at Queen Stoves (1953) in Albert Lea before enlisting in the U.S. Navy. Alvin was stationed at bases in Panama and Bermuda and assigned to the bomber crew team, as part of a VP 45 (Heavier-than-Air, Air Anti-submarine) squadron. In the fall in 1958 he met the love of his life, Ann Marie Thompson, launching their nearly 60-year adventure together. They married June 13, 1959 in Duluth, and farmed in the Emmons area before adopting their two children, Troy and Annamarie. Alvin also worked as a tool and die maker in Lake Mills and served on the Nunda Township board from 1982 – 2006. They moved into their new home in Albert Lea in February 2014. Alvin was a strong patriarch of his family, a patriot to his country, a good friend to all, and a man who would unfailingly help others before himself. He will be sorely missed by his many beloved friends, relatives, and extended family. Alvin is survived by loving wife, Ann Marie; children, Troy Thompson (Michelle) of Clarks Grove, MN; Annamarie Saarinen (Paul) of North Oaks, MN; Grandchildren, Holly Thompson, Cody Johnson, Jack Hingos, Elle and Eve Saarinen; and Great Grandchildren, Ashton Johnson, Arya and Jayce Hingos; brothers, Ronald Thompson (Nyla) and Gilman Thompson (Nylene); sisters-in-law Linda Peterson, Lois Koehler, June Hall (Allan), Susan Kreager (Russ); and brother-in-law Odell Odberg (Lovey) and many nieces and nephews. He was preceded in death by his parents Anna and Harold Thompson, step-mother Charlotte; father and mother-in-law, Gunder and Verna Odberg; brother, Gordon Thompson and brothers-in-law, Roy Odberg (Jane) and Manley Koehler, sister-in-law Linda Peterson’s husband, Harlan; and niece, Kelly Kreager. The family would like to thank all the wonderful staff and volunteers at the Albert Lea Hospice who comforted and cared for him in his last weeks of life. In lieu of flowers, memorials may be made to Emmons Lutheran Church, Albert Lea Hospice or NewbornFoundation.org.